IMEX in Frankfurt, taking place from May 16 to 18 at Messe Frankfurt, is set to provide a newly inspiring experience this year, one that’s been fine-tuned to fit the needs of a variety of visitors. 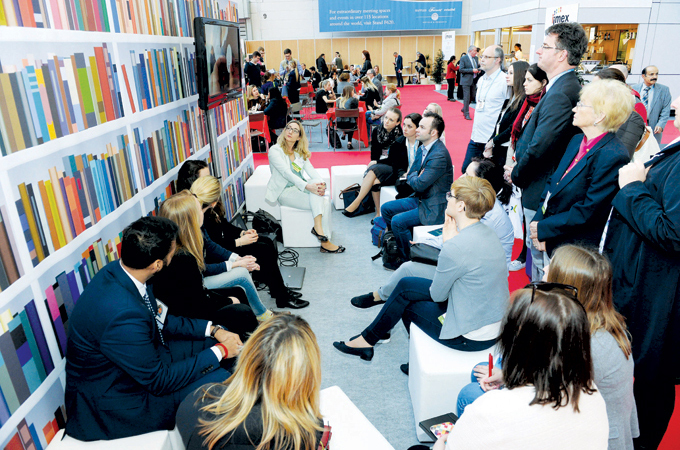 Alongside a wealth of new exhibitors and networking opportunities, the Imex team is launching a brand-new education experience, EduMonday, taking place the day before the show on May 15. EduMonday combines contemporary learning styles with hot industry topics and the latest personal development teachings. With registration free of charge and open to all, this new pre-show day will offer training in event design, critical thinking, industry trends as well as education specifically for suppliers. This new Imex EduMonday programme delivers a contemporary, interactive approach with experts from the new Zeus Eventtech Academy, GCB (German Convention Bureau), Meetology Masterclasses and Play with a Purpose all taking part. Imex is also offering Event Design Certificate Programme Level 1 of Mastery as part of a three-year agreement with the Event Design Collective. This will allow 30 English and 30 German-speaking event professionals to take their career to the next level by taking this certification free of charge on the day. From Tuesday May 16, a wider programme of free education runs across the three days of the trade show with 150 sessions, including workshops, campfires and bite-sized show-floor education. Participants can choose from carefully selected tracks to build a bespoke schedule that complements their daily exhibitor appointments. The future of events will once again be a hot topic at Imex with the IAEE exploring Global exhibitions and events industry trends. MPI will also be offering a deep dive into the industry’s business trends based on their most recent Meetings Outlook research. The German Convention Bureau (GCB) will share the latest impact trends, innovations, and societal developments as part of their Future Meeting Space project. The future of destination marketing will be covered by DMAI, and ILEA’s global panel of 'Global Event Summiters' will share their views on how the economy is shaping the event business. An industry hot topic and new Imex Talking Point, Purposeful Meetings, will be explored in a session by Janet Sperstad, recently rated as one of the top 25 Most Influential People in the Meetings Industry (Successful Meetings). She will present white paper research on the five ‘pillars’ of purposeful meetings: Meeting design, Wellbeing, Behavioural science, CSR/Legacy and Event technology. Whether its hotel chains or hotel brands, new technologies, association or corporate meetings trends, travel legislation or even climate change, as a truly global showcase for the meetings and events industry Imex is the best place to gain a snapshot of the whole market. With the largest global array of exhibitors from every meetings industry sector, buyers can meet 3,500 worldwide organisations and hundreds of meeting professionals and discover the latest trends under one roof.